Ladies hats, mens hats, childrens hats - we have boxes for all of your hats. Top hats, knit hats, Church hats, derbys, Easter bonnets, Red Hatters, tiaras, crowns and more. Youve got a hat and we have the box to put it in. These beautiful fabric Hat Boxes are made in the USA using odorless, nontoxic adhesives, recycled chipboard and high quality fabrics. 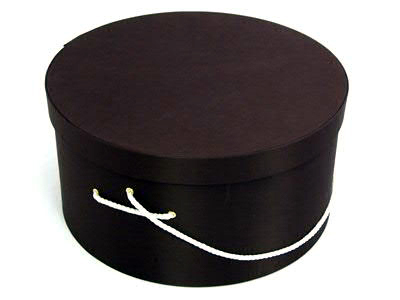 Our hat boxes are made with a traditional cording handle that enables you to carry the box from the top or from the side. The sizes listed are inside dimensions so you can be sure your hat is going to fit. Custom sizes are also available. Dark Brown - The new classic color, deep chocolate brown with a cream cording handle. We try our best to have all of our items ship for 1 flat rate... When ordering more than one of this item, you may not qualify for our flat rate shipping. 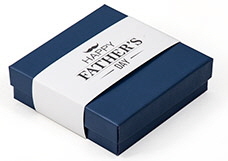 We may contact you via email and/or phone to estimate additional shipping costs. 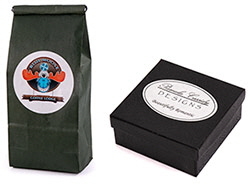 Unfortunately Dk Brown Hat Boxes is not currently available as a sample. It can be ordered as a regular order from the previous screen.